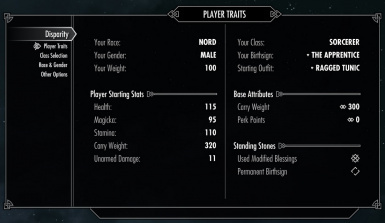 Requires Dawnguard, Dragonborn, SKSE, and SkyUI 5.1+. Disparité - Traduction française d'Edghar. 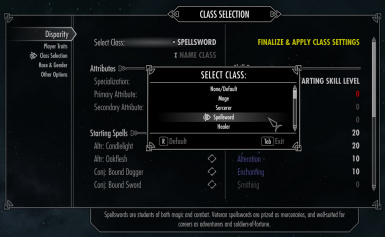 Installez le mod en VO, puis installez la traduction en écrasant les fichiers du mod original. Lisez-Moi et tableaux inclus. If you are using a version of SkyUI older than 5.1, then you must use this patch. First, install the main Disparity file, then download and install this patch, overwriting the scripts from the main file. 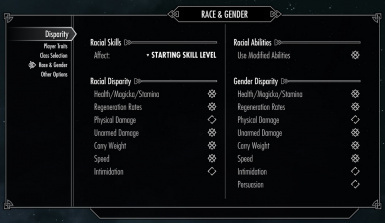 This is a replacement plugin for Custom Races by d_rail. You must first install the file from the Custom Races mod page, then overwrite the plugin with this modified file. 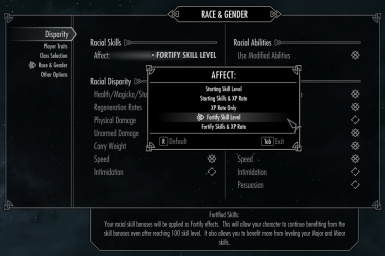 This will allow Disparity to treat the custom races from that mod exactly as if they were the vanilla races. 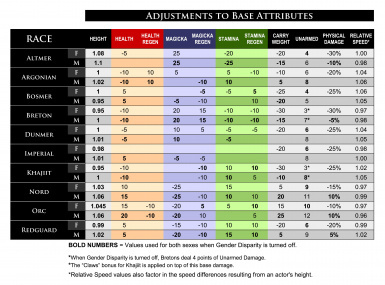 I also carried over some changes from the Unofficial Patch that were missing from the original file. 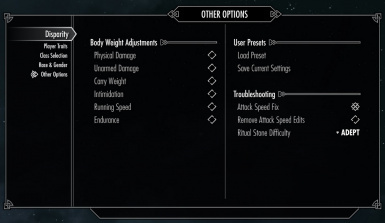 Compatibility patches for PerMa. You must choose the correct file to install depending on your PerMa installation. 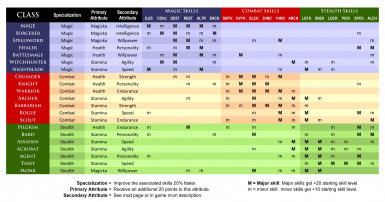 This is just a simple edit to the English translation file so that Disparity's MCM remains consistent with PerMa skills and spells. No additional plugin required.